The considerable influence of inherent uncertainties on structural behavior has led the engineering community to recognize the importance of a stochastic approach to structural problems. Issues related to uncertainty quantification and its influence on the reliability of the computational models are continuously gaining in significance. In particular, the problems of dynamic response analysis and reliability assessment of structures with uncertain system and excitation parameters have been the subject of continuous research over the last two decades as a result of the increasing availability of powerful computing resources and technology. 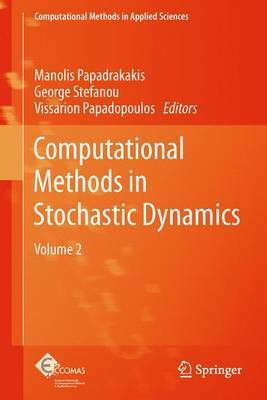 This book is a follow up of a previous book with the same subject (ISBN 978-90-481-9986-0) and focuses on advanced computational methods and software tools which can highly assist in tackling complex problems in stochastic dynamic/seismic analysis and design of structures. The selected chapters are authored by some of the most active scholars in their respective areas and represent some of the most recent developments in this field. The book consists of 21 chapters which can be grouped into several thematic topics including dynamic analysis of stochastic systems, reliability-based design, structural control and health monitoring, model updating, system identification, wave propagation in random media, seismic fragility analysis and damage assessment. This edited book is primarily intended for researchers and post-graduate students who are familiar with the fundamentals and wish to study or to advance the state of the art on a particular topic in the field of computational stochastic structural dynamics. Nevertheless, practicing engineers could benefit as well from it as most code provisions tend to incorporate probabilistic concepts in the analysis and design of structures.